Electrolysis is a decomposition of a liquid by passing a direct electric current through it. 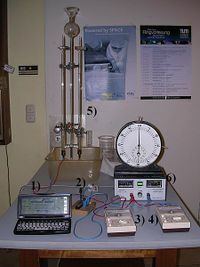 The first laboratory electrolysis of H2O to H2 and O2, was performed in 1800, and the process is still used today to produce these gases at a high level of purity. ↑ Conoley, Chris; Hills, Phil (2008). Chemistry (3rd ed.). London: Harper Collins Publishers. p. 471. ISBN 978-0-00-726748-4. ↑ Silberberg, Martin S (2010). Principles of General Chemistry (2nd ed.). Boston: McGraw-Hill. p. 740. ISBN 978–0–07–351108–5. ↑ Ebbing, Darrell D.; Gammon, Steven D (2009). General Chemistry (9th ed.). Boston: Houghton Mifflin Company. p. 643. ISBN 978-0-618-85748-7. This page was last modified on 3 August 2014, at 20:30.